The streets of Vilnius heard people speaking Russian, Yiddish, Lithuanian, Polish, German, Turkic languages, saw people praying, singing and trading. The life was flowing through the neighborhood of different ethnic groups, with their unique traditions and lifestyle on the one hand, and common everyday issues on the other. Did you know that Vilnius is a place where Muslim Tatars and Jews Karaites shared common cemeteries? That Vilna Gaon formed a commentaries for Babylonian Talmud and this edition became a canon of Talmud up to these days? Those and many other things reveals while traveling in Vilnius and its vaccinates. The excursion in Vilnius will be followed by a conference dinner. The conference dinner will take place in Trakai Historical National Park (about 27 km west of Vilnius). In this unique and compact ensemble of natural and cultural heritage, which reflects important periods and events in the history of Lithuania and eastern Europe as a whole, we can see a beautifully preserved cultural landscape centred on an historic town and castles which are nestled in lake land. If you would like to take one or more private tours or have any questions regarding tours registration, please contact the travel agent directly using provided email address. The registration due for one day tours is July 15, 2018. „I did not think Lithuania is such a beautiful and clean country“ – once were told by a visitor. To prove this we are inviting you to take a part in tours and see by yourself the most picturesque and magnificent views of Lithuania. 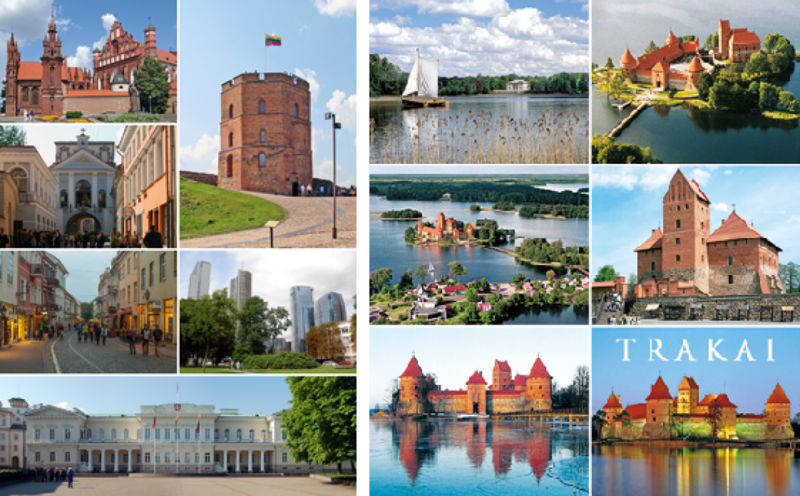 Visit Lithuania and not to visit the legendary Trakai Castle - so do not visit Lithuania. Trakai and Kernave - two historical capital of the Grand Duchy of Lithuania, surrounded by amazing nature. Trakai, which lies in the National and Historical park of Lithuania, is famous for its unique landscape enriched with some 200 lakes and the medieval castle on the Island of Galvė Lake. It is the only one of its kind in Eastern Europe. The Lithuanian Troy, Kernavė, a place that represents the primeval past of Lithuania. On the picturesque bank of the Neris River stand five hill-forts where our ancestors have settled, lived and been buried since time immemorial. Numerous archeological finds testify to the historical processes and cultures which have existed in the area for 11 000 years. The cultural heritage of the last pagan country in Europe – the remains of an ancient capital of Lithuania – lies hidden under a layer of deposits. Since 2004, Kernavė has been included in the UNESCO World Heritage List. Trakai Castle is lovely any time of year, but in the warm season Trakai offer tourists not only visit the historic sights, but also plenty of fun activities, such as concerts in the castle and the palace Tyshkevichs or sailing on the lake Galves. Regional park of Neris river turns. gallery – museum of H. Orakauskas. Register at violita@proarte.lt by sending your full name, e-mail and telephone number. Please indicate 'TOUR TO TRAKAI CASTLE AND KERNAVE' in the subject field. Kaunas - the second largest and most important city in Lithuania. Many guidebooks call the Lithuanian city of Kaunas most, even more commonly used name - temporary capital. Kaunas history begins in the 13th century, and this city really has something to show inquisitive tourists: the beautifully preserved old town, interesting museums, architectural monuments. In the city day and night life rages - it is an important cultural and industrial center. Guests struck by the contrast of this city 's rich history and romantic legends, ancient traditions and modern art. When you decide to visit Lithuania you should not forget that this is not only a country with a rich This spring-autumn, I invite You to a momentous trip full of authentic towns and picturesque landscapes – THE TOUR OF NEMUNO DELTA AND CURONIAN LAGOON. NEMUNO DELTA is a unique historic region of Lithuania. It attracts our eye with wonderful, and at the same time, specific nature. This tour will take You to an amazing place in the world which You will never forget. Its flora and fauna will make a great impression for its miraculous views. NEMUNO DELTA is full of unforgettable places to visit, so join the tour and see everything Yourself! The Mount Rambynas and small cemetery of the 18-19th century and interesting history, but also a place with a unique and beautiful nature. 6 PM arrival to Klaipeda. Overnight in Klaipeda. Inviting you on a private tour of the Curonian Spit, I want to show you part of the world, which has no analogues anywhere on the planet. Sand mound between the Curonian Lagoon and the Baltic Sea is capable of hitting, surprise and delight not only unusual nature, the fresh sea air, but also cultural heritage, unique sights, shrouded in myths and legends. The grounds where we are going, belongs to the historical " Lithuania Minor ", and the architecture towns and villages is very different from what you have seen in Vilnius, Kaunas and other Lithuanian cities. 9am departure to Nida – Curonian Lagoon UNESCO HERITAGE SITE. Curonian Spit – a unique corner of nature Lithuania, protected by UNESCO. It is a peninsula of sand dunes that separates the Curonian Lagoon from the Baltic Sea. The Mithological hill of Witches. Lunch in Nida and departure to Vilnius. Late night around 11 pm arrival in Vilnius. 2 ferry trips are on the road in this tour. Must have comfortable shoes.